Last week a special commemoration event took place in Edinburgh to mark the death of Greyfriars Bobby – the small dog with a big heart. Local school children and the city’s Lord Provost gathered around his grave for a touching tribute to the dog who has captured hearts around the world. Bobby’s something of an institution here in the Capital with visitors and locals flocking to the Old Town to hear his story. For those of you who haven’t heard the tale of Bobby and his master John Gray then visit the Greyfriars Bobby website who tell the story better than we ever could. If you’re visiting Edinburgh then a must is to check out Greyfriars Bobby’s Bar in Candlemaker Row and ask for a pint of local ale Deuchars IPA – we highly recommend it. 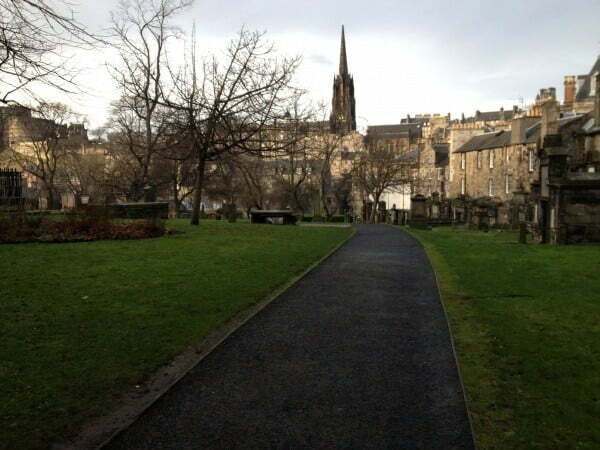 And if you’re feeling brave take a tour of Greyfriars Kirkyard and Edinburgh’s Old Town – check out the best tours on the Mercat Tours website. Lastly, at the entrance to Greyfriars Kirkyard we spotted “The Creepy Wee Shop in The Graveyard.” We LOVED the name of this shop but sadly it was closed for the day when we were there but well worth a visit – even just for the name. ← Greatbase in the News!